The UAE outlined its efforts in constructing a strong and sustainable space sector that contributes to regional and international efforts to promote space exploration, and its development of advanced technologies to enhance the quality of life and contribute to the overall achievement of the Sustainable Development Goals at the United Nations General Assembly. 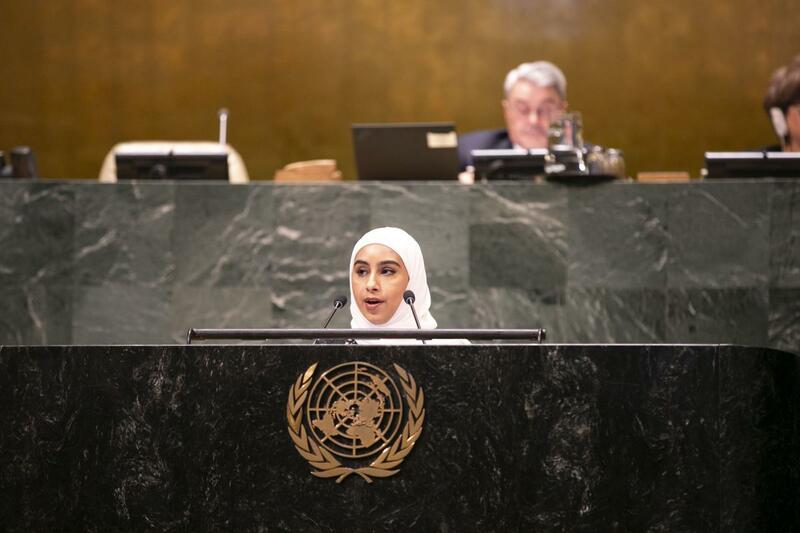 The UAE’s Youth Representative, Ms. Maryam Al Zaabi, delivered the UAE’s statement in a meeting titled "Space as a driver of sustainable development”. She noted that the UAE is developing projects and policies related to the outer space sector in the next 100 years – the most prominent of which is the Mars 2117 Program which aims to establish the first human city on Mars by 2117. She underlined the critical role played by the UAE at the national and regional levels in the outer space sector, including its efforts to make the UN Conference on the Exploration & Peaceful Uses of Outer Space “UNISPACE +50” a success. In 2016 and 2017, the UAE hosted two of the three preliminary forums ahead of the conference which led to the adoption of the “Dubai Declaration”, which provides recommendations to be adopted within the UN Space Agenda 2030. She underscored that Emirati youth play an important role in the future of exploration and peaceful uses of outer space, and highlighted the UAE’s commitment to training young Emirati cadres to lead the national, regional, and international efforts to explore and use outer space in peaceful ways. She pointed out that the Emirates Space Agency Youth Council aims to empower the next generation of space leaders by providing them with a platform to further develop their ideas. She also emphasized the achievement of sending two young UAE citizens, who have been trained through the UAE astronaut program, to be the first Arab astronauts on the International Space Station. During her statement, she highlighted the UAE team of engineers who have designed and built the “Khalifa Sat” satellite - the first satellite manufactured in the UAE. Additionally, she recognized UAE student Alia Mansoori and her experiment which was awarded first place in the “Genes in Space” competition in Abu Dhabi and was subsequently launched on the Falcon 9 rocket from NASA. She noted that 2020 is expected to be an important year to the UAE’s space sector and the Emirati youth as the UAE will host the International Conference on Astronautics in Dubai. The UAE will be the first Arab country to host the conference since its inception in 1950. 2020 is also when the Emirates Mars Mission will be launched. The Mission seeks to build on Emirati technical and intellectual capabilities in the outer space sector and contribute towards expanding the UAE’s knowledge in space technology. The spacecraft is expected to arrive in Mars in 2021, coinciding with the 50th anniversary of the founding of the UAE.